Medellín is Colombia's second largest city and is nestled in the Aburrá Valley of the Andes Mountains. It was founded in 1616 but remained a small, under-the-radar locale until the Colombian coffee boom. It later became the center of a textile industry, and today is a modern, vibrant city. Medellin is a principal manufacturing and industrial area, as well as a commercial flower-growing region, particularly focused on orchids. In fact, Medellín is often called the Capital of The Flowers and The Land of Eternal Spring. Many international airlines fly into Medellín using the international José María Córdoba airport, just 20 miles southeast of the city. Regional flights use the older Olaya Herrera airport. Affordable flights can be found on LATAM Airlines, Copa Airlines, and JetBlue, as well as budget carriers like Spirit. Once you land, you can take a shuttle from the airport into downtown. If you're already in the country, look into bus services, which are available between most major Colombian cities from the Terminal del Norte or the Terminal del Sur. Those who plan on venturing outside of the city should rent a car. Medellín is the first Colombian city to have a metro system. It serves the city in both north-south and to the west, which makes getting around the city very convenient and easy. The equator runs through the center of the country, so Colombia has warm, moderate weather year-round. The temperature varies depending on the altitude. 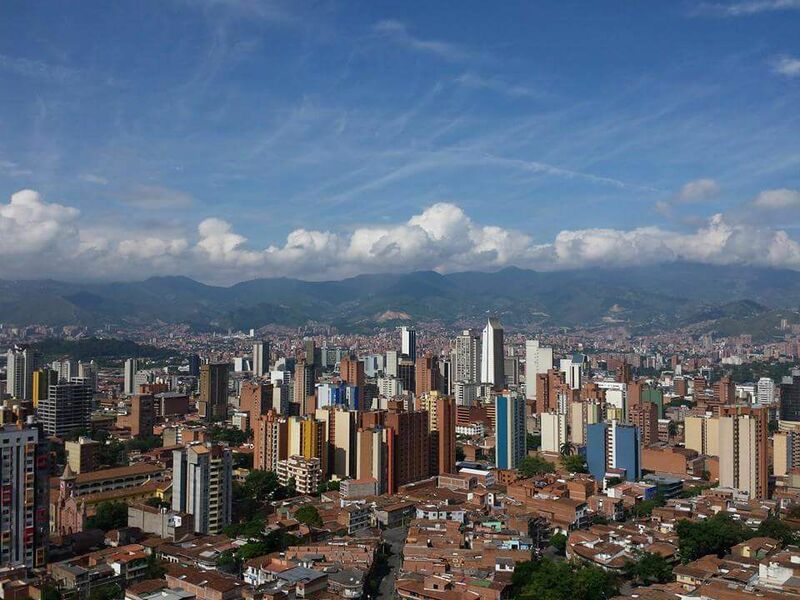 Cities closer to sea level (about 80 percent of the nation) have hot 80-degree days, whereas cities higher and near the Andes, like Medellín, tend to have comfortable 70-degree weather. Although there are no traditional seasons, tourists may want to avoid visiting between April and May, as well as September through November, when the country experiences the most rainfall. Early August is an ideal month to travel to Medellín when the Fería de Las Flores festival is in full bloom. Medellín may be smaller than the Colombian capital of Bogotá, but that doesn't mean it has any less cultural sights and museums for visitors to enjoy. The Medellín Metro Cable system has three cable car lines across the valley floor. Ride them to the top for scenic views of the city and mountains beyond. Basilica de la Candelaria is one of the few colonial buildings left. The Basilica Metropolitana, in the Parque de Bolivar, was completed early in the 20th century and is thought to be the largest brick church in South America. Pueblito Paisa is a replica of a typical Antioquiana village, complete with handicraft shops. Plaza Botero displays a number of works by Fernando Botero, a famous Medellín sculptor who specializes in oversized human figures. More of his works are in the Museo de Antioquia. The JardÍn Botánico JoaquÍn Antonio Uribe has an annual orchid exposition in the Orquideorama. Colombia has some of the most festive holidays of any country in South America. Medellín celebrates many regional festivities, as well. Fería de Las Flores is one that should not be missed. The festival begins with a caballero (horseback) parade through the city that lasts the entire day. Music, dances, and cultural events celebrate the Antioquiana customs, but the highlight is the Desfile de Silleteros, where campesinos come down from the mountains carrying baskets of beautiful wildflowers. In July, the annual Festival Internacional de Poesía de Medellín, or International Poetry Festival, brings artists, writers, and musicians from far and wide. Before you jet off to Medellín, there are some things you may want to plan ahead for. A tourist visa is not required to visit Colombia unless you plan on staying longer than 90 days. The water in Medellín is safe to drink, although most hotels will provide bottled water just in case. If you're traveling to rural areas outside of the city, it's smart to only drink bottled water. The Colombian peso is the only currency accepted at small, local stores, and there are many ATMs around the city for getting more cash out. Most hotels and upscale restaurants accept credit cards. The local attire is a bit formal, so leave flip-flops at home. Men should wear long pants, and women should pack nice sundresses.